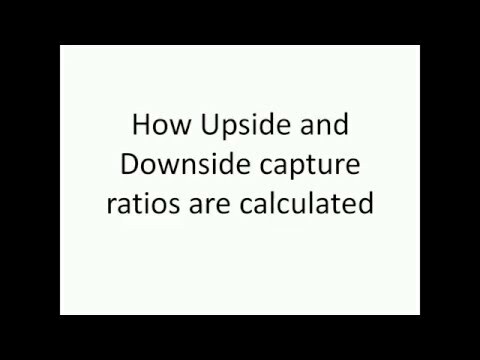 Upside and Downside capture ratios are easy-to-understand mutual fund performance measures. Consistent downside capture ratios can be combined with consistent returns (try the mutual fund screener) to select and review mutual funds. Regular reader may be aware that I am a fan of the downside capture ratio. In this post, I present a video that describes how these ratios are calculated with an example. What is upside capture ratio? Over a given period, a benchmark (index) could have given a set of positive or negative monthly returns. Whenever the index gave a positive return, how did a fund fare? How much of those positive index returns did the fund ‘capture’? The upside capture measures this. Obviously, higher the upside capture, the better. What is downside capture ratio? Whenever the index gave a negative return, how did a fund fare? How much of those negative index returns did the fund ‘capture’? The downside capture measures this. Obviously, lower the downside capture, the better. Sometimes the downside capture can be negative. Typically this means, that the fund gave a positive return, while the index gave a negative return! Where can I get these ratios? At Morning Star India. See above link for an example. Please note the benchmark used for calculation before interpreting numbers. Balanced funds may give weird results. Over the last year, HDFC Top 200 has only captured 47% of BSE 100’s (its benchmark is BSE 200) positive returns and 98* of its negative returns. Three and five-year numbers are pretty bad as the fund has captured 108% and 104% of BSE 100’s losses respectively. Hard for anyone to justify that performance! At the outset thanks for the great education as always. Just one thing, I was trying to replicate your calculations on my excel sheet and find in the downside capture ratio, the CAGR of the fund is +1.22% & not -1.22% as mentioned by you. Could you please re-check, and also let me know if this be the case, would it imply that the down side capture ratio is 0% or what??? Nice catch! It is +1.22%. The downside capture is a ratio so it cannot be zero: +1.22/(-8.94%) will be negative. Which is a good thing! This is mentioned in the post, but I did not realized this mistake. Thanks. numbers are theoreticle, just for clarity. Yes that is correct. A fund with Upside capture ~ 100 and downside capture ~ 100 is an index fund!